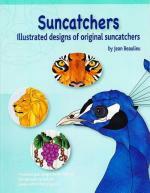 40 pages packed full of delightful suncatcher patterns. Designs include: hummingbird, bunny rabbit, cup of java, ice cream, cactus, boo ghost, snowman, ball cap, chili, piggy, goose, elephant, cowboy boot, puppy dog, candle and much more. Colored pattern folder featuring 17 full-size heart heart and flower, heart and butterflies, and heart and bird designs from a lovely Victorian panel to whimsical suncatchers, some using bevels or jewels. Vegetables, fruit and garden critters are featured in this new book. 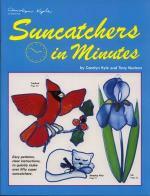 Make suncatchers for the kitchen, stepping stones for the yard, or plant identification markers for your garden. 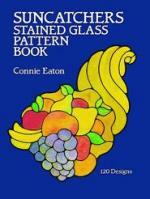 Includes full-size patterns and full color pictures of each project. 87 full-size designs for suncatchers with various themes; tulips, roses, orchids, unicorn, butterflies, bears, parrots, shooting star, whimsical items and many more flowers and animals. 56 pages, 12 in color. 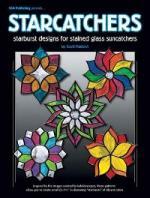 Ever since Scott's "Starbursts" pattern book was released 3 years ago, glass crafters have been requesting smaller "suncatcher size" versions of the kaleidoscopic images in that collection. 20 full-size starburst patterns that are only 6" to 7.5" in diameter. You can use any combination of your favorite glass colors and textures in these easy-to-create window hangings. Rather than filling up a window with one large Starburst, you can hang several of these smaller Starcatchers to liven up a room. They also make excellent gift items. 14 patterns from various aspects of life. Designs include a rose, butterfly flower, Helvetica eagle, Butterfly Woman, Lion, Birds of Paradise, elegant grapes, closeup of tiger eyes, Budda, Woman and grapes, Peacock, Iris versicolor, Rabbit, and a couple pints in an Irish Pub! Each pattern is shown in full color and color suggestions are included. Designs can also be used in panels and free-form projects. This fun-filled guide offers step-by-step details on how to create 120 lovely lightcatchers: butterflies, birds, fish, wreaths, musical instruments, sailboats, teddy bear, many more. 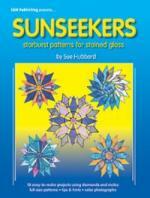 Take a few shapes of stained glass, add some jewels and nuggets and you've got sunseekers. Tips are given for choosing glass, cutting diamonds, and foiling glass nuggets. Full color photos are provided with each design. Circle and oval designs just the right size featuring easy to make Victorian, floral, and nature scenes. 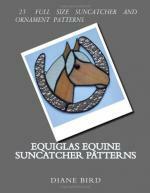 Includes 26 full size patterns with extra patterns for frames to add to the basic designs. Full color photos of all projects. 113 charming designs are patterned after Victorian-era suncatchers, ranging from a single splendid tulip to magnificent butterflies and a dazzling damsel greeting the dawn. The boldly outlined patterns also portray bright masses of flowers, plump cherries ready to be picked, and sparkling portraits of birds.